I would like to keep UAC enabled but I've come across a strange problem caused by it on Windows 10 with the latest Novell client. If UAC is enabled mapped drives are mapped just fine but are not available through anything which requires elevated privileges. 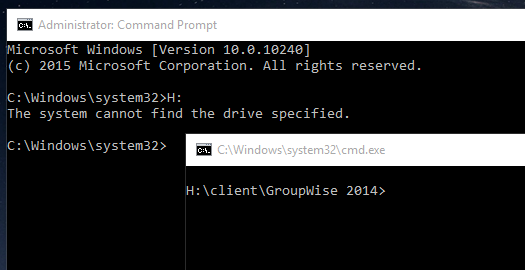 For example: I can access a mapped drive through a non-elevated command prompt but not through an elevated one. Needless to say this is quite irksome if I need to run something off a network resource which requires elevated access. ie: script files cannot be run as an administrator from the context menu and software installations which make calls to run other setup packages as part of the setup process do not work, as they cannot be found. One way I have managed to map the drives in an elevated manner is to kill nwtray, right click run it as Administrator and login again to re-map the drives. The problem with this is if I set the exe to always run as an Administrator it does not load with Windows. Is there anyway to resolve this issue and keep UAC enabled?